Liz is a founding member of Mending Collective, along with Amanda Eicher and Leeza Doreian. 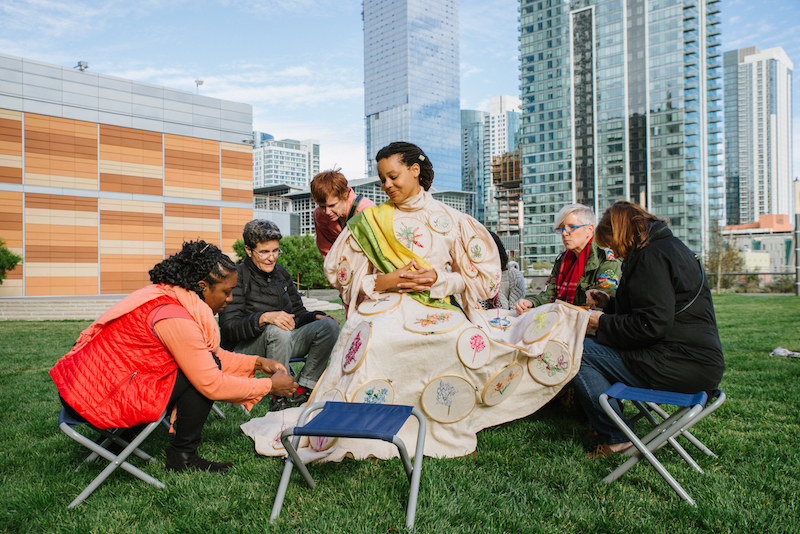 Mending Collective is a new collective of artists who wish to create a space for people to come together to learn and practice visual mending techniques. Mending Collective is concerned with economic models built on burgeoning consumption and waste specifically within the garment industry, but indicative of production in general. We explore the traditional practices of mending as a means to counter this narrative. Currently, Mending Collective is made up of Leeza Doreian, Liz Harvey, and Danielle Wright. We are excited to curate an exhibition in November - December 2018 at Chandra Cerrito Gallery as Curators-in-Residence in Peripheral Visions program, featuring Frau Fiber, Mansur Nurullah, and Angie Wilson. Most recently, for the lost ones, a multiyear durational performance project, Mary Armentrout, Cherie Hill, and Megan Nicely have been choreographer collaborators. Performances are ongoing around the San Francisco Bay Area...stay tuned for additional locales. Harvey has shown her work in numerous exhibitions in California as well as in New York and Italy. She is a recipient of awards from the California Arts Council, the Peninsula Artists Fund, and the Los Angeles Cultural Affairs Department. Harvey lives and works in the San Francisco Bay Area.